Update: It’s been YEARS now since I got these, my original chicks. And I’ve added several new ones to the flock including some Marans, an Ameraucana and some F2 Olive Eggers! 4 months ago my boyfriend presented me with a cardboard box full of baby chicks. 3 months ago I started to build a chicken coop for them. 2 weeks ago, I finished it. I normally do a lot of talking and funny story telling at this point in my posts, but not today. Today, I’m just going straight to the pictures. Not ’cause I don’t have a lot of funny stories to tell. I do. Lots of em. It’s just that I have the feeling you’re gonna skip past all of the writing and go straight to the pictures anyway. So why waste the funny? Funny is a horrible thing to waste. 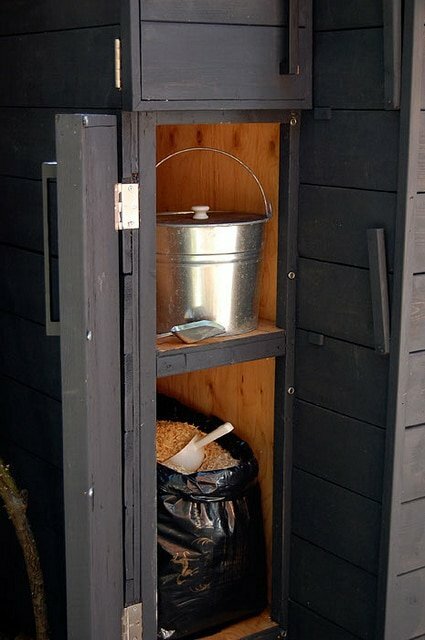 The box attached to the left side of the coop houses the exterior nesting box on top (which the chickens have access to from inside the coop) as well as storage in the larger door below. Both of the doors have double security features. You can’t be too cautious with a neighbourhood full of cats, hawks, raccoons, skunks, neighbours and other egg loving monsters. 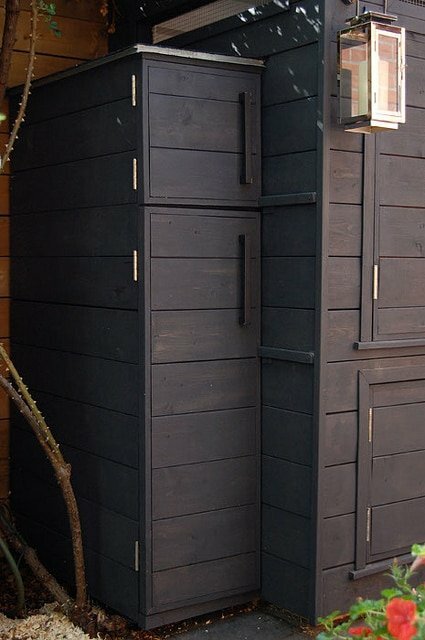 Each door has a series of small Rare Earth Magnets, PLUS strips of wood that pivot and lock the door in place. That was the fella’s idea. It’s completely functional and brilliant. 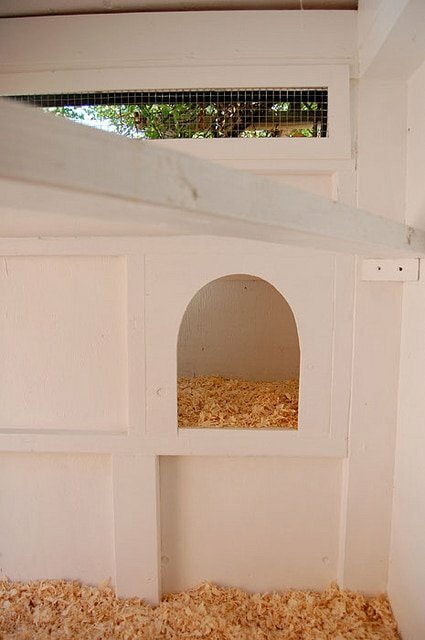 The lower storage compartment holds feed, treats, the egg basket and pine shavings. 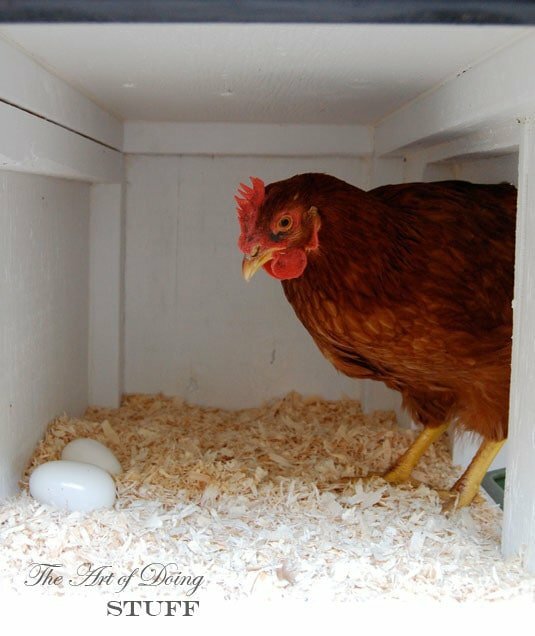 The nesting box holds … well … eggs eventually. I hope. 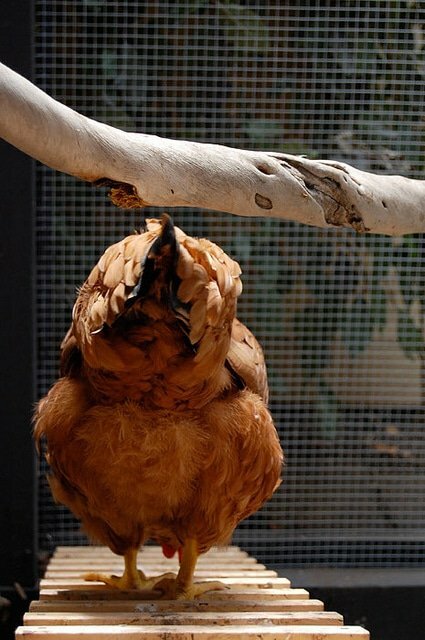 Oh my God, what if they never lay an egg? 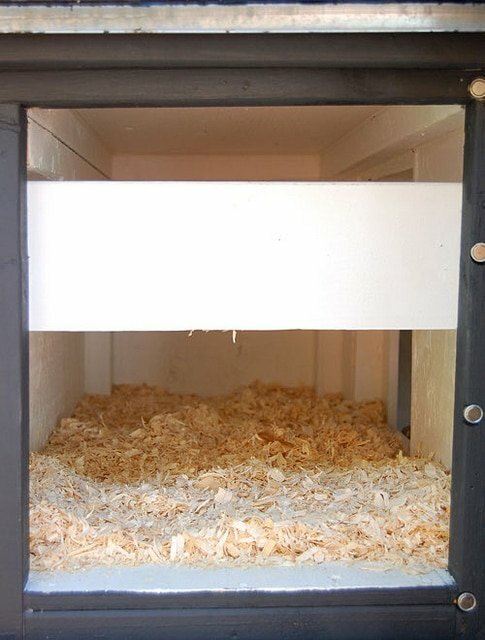 I built a sliding piece of wood into the nesting box to make sure no eggs accidentally roll out. Plus I can slide it up for easy cleaning of the box. I know what you’re going to be thinking when you see this next picture. You’re gonna be thinking … there’s EGGS! No. There are no eggs. Those are fake eggs which we put in the nesting box to encourage the chickens to lay their eggs in there, as opposed to some random spot in the coop or run. 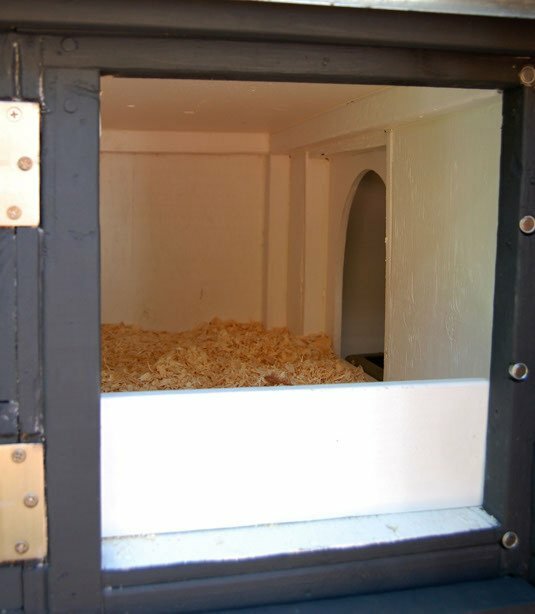 This is the door going into the nesting box as seen from inside the coop. Like my gates, all the coop doors close with Rare Earth Magnets. Definitely predator proof. To help the coop air out and to give us a better view of all the girls during the day I made pull out screens for both the upper and lower doors. The coop is directly across from my dining room window, so when we’re sitting down to dinner we can watch the girls put themselves to bed at 7:30 every night. I love the screens. 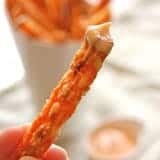 They’re one of those things I didn’t intend to make, but ended up whipping up right at the end of the project. I cannot tell you what the coop cost to build, because I have no idea. Like so many other coop builders before us, we stopped counting when it got scary. Of course, I saved when I could. Guess you’re curious about the ring. It’s my pride and joy. 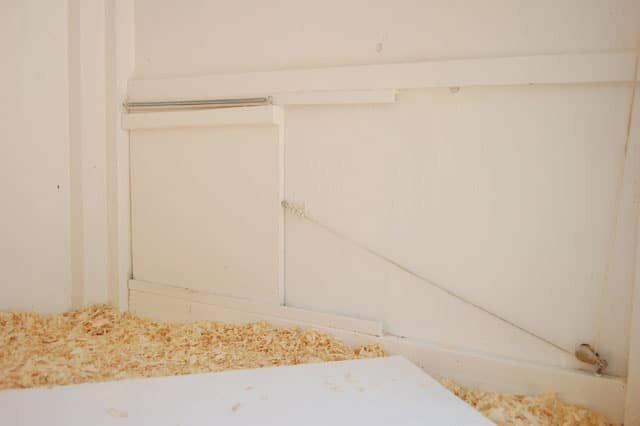 It leads to a little door inside the coop. 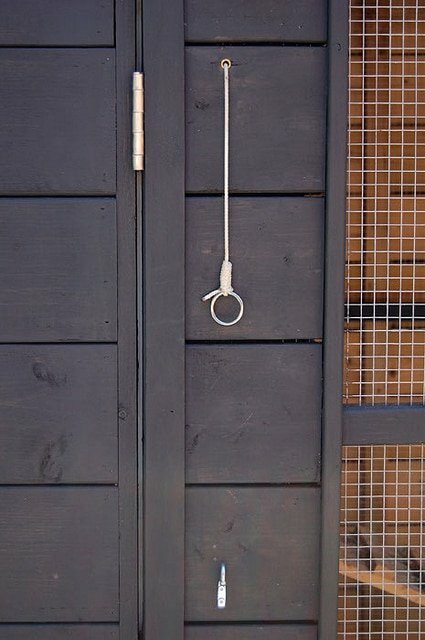 The rope runs through a configuration of pulleys and eye hooks. So to open up the door to the run all we have to do is pull the ring and the door slides open effortlessly. 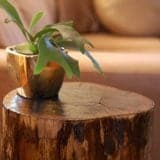 The ring then slides onto the hook below to keep it open. To close it we just remove the ring from the hook and the screen door spring at the top of the door, pulls the door shut automatically. 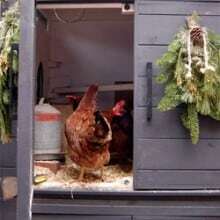 Thanks to Heather Bullard and her coop for inspiring this particular aspect of my henhouse. The galvanized tub is filled with dirt. The hens LOVE to jump in it and give themselves dust baths. The tub is from my mother’s house. When I was teeny tiny she used to use it as a pool for me. 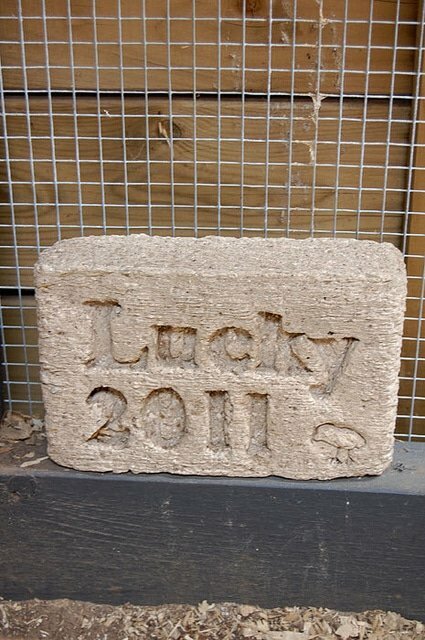 In honour of little Lucky who died early on. Thanks to LeeAnne Bloye who kindly made the little gravemarker and sent it to me. 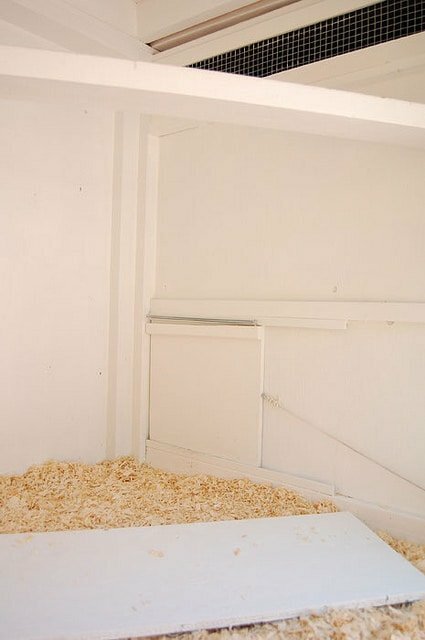 Looking down into the run from the door inside the coop. I spent an hour or two at the cottage earlier this year searching for the perfect piece of driftwood to act as a perch in the run. This was the piece I deemed perfect. Every morning all 4 chickens relax in the sun on the perch. A skylight. Yes. 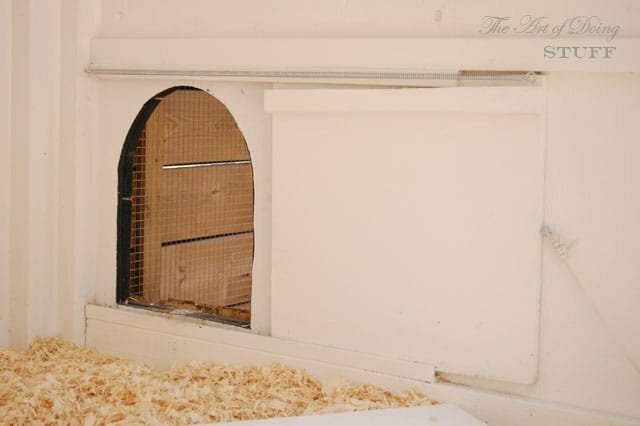 I installed a skylight made from a sturdy piece of Plexiglass to allow more light into the coop. My house does not have a skylight. 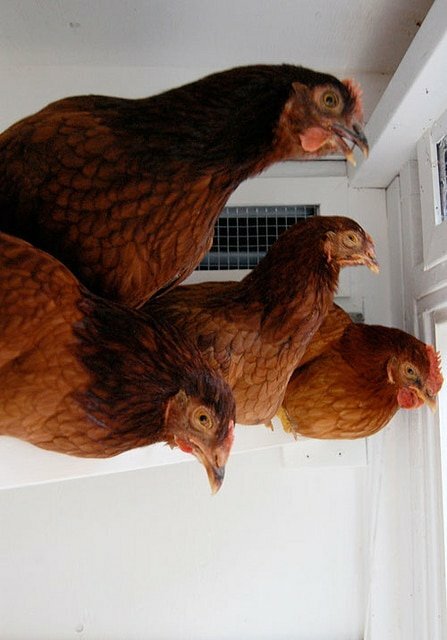 At 7:30 every night like clockwork, the girls head themselves up the ladder to the coop and jump up on their perch to roost for the night. That’s it for now. If you’re interested, here’s another post with a few more details about the coop experience including shots of me building. And I’m sorry, but I do not have any building plans for the coop. I made it up as a I went with inspiration from both Heather Bullard’s Chez Poulet and Mitchell Snyder’s Modern Coop which was featured in Dwell online. 3 months, 2 major injuries and a huge learning curve later the coop is complete. And I couldn’t be happier with it. Absolutely beautiful Karen! I knew it would be, but I’m awed by how lovely it is! 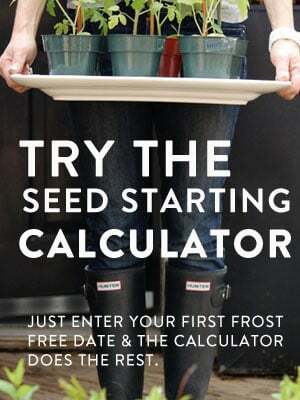 You’ve got some very lucky chickens! This was totally worth staying awake for! Congratulations on completing your coop! 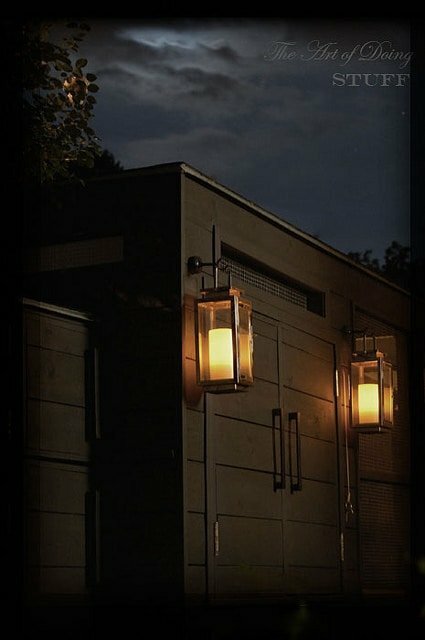 I have been designing residences (Human) for almost 50 years, and I have never seen anything so beautiful. Thank you for sharing. I am tempted to adopt the motto “Castles to Chicken Coops”, and see how well I stack up. Donna – LOL. 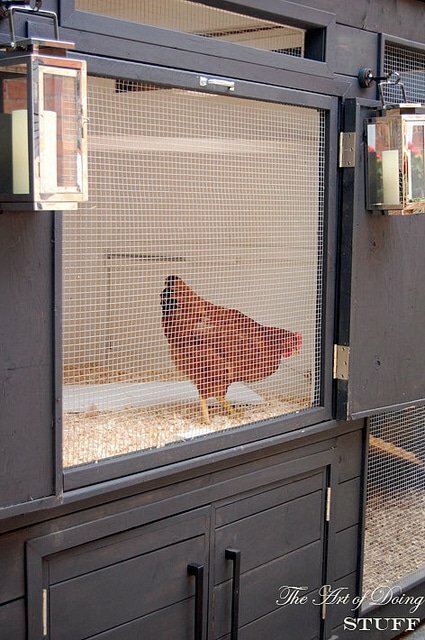 Um, the coop is 11 feet long by 4 feet wide. It’s a bit too big to be a chicken tractor. Also, chicken poop is actually too strong to be put directly on any grass or vegetables. It needs to compost. 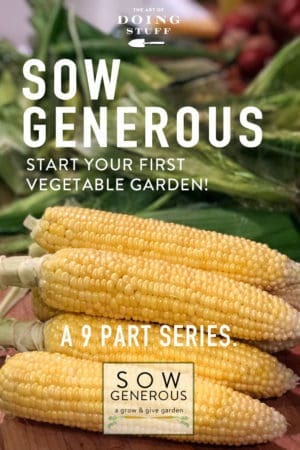 I just shovel out the poop, compost it, then put it on the garden after several months. ~ karen! 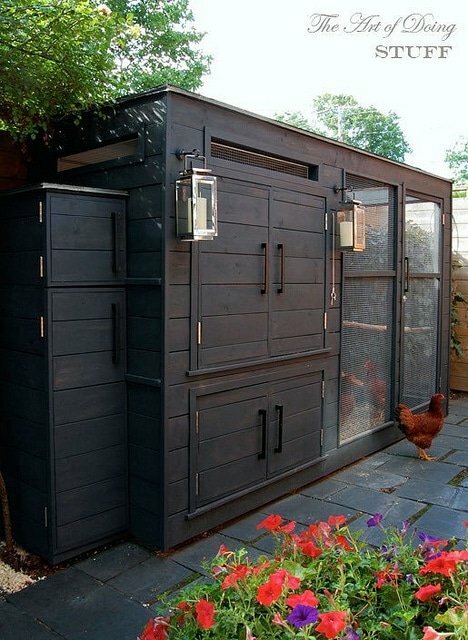 Love the coop!A great balance between style and functionality. I am totally inspired. We have a small tractor style coop, but I need something bigger. More on the poop question…. 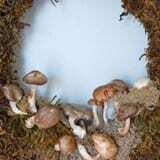 It looks like you use pine shavings, how often do you shovel it out/ change the shavings completely? 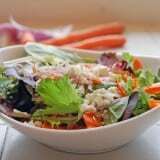 Do you compost with the shavings? Another quick question not poop related…., do you have any protection from burrowing predators? In our small tractor coop i added wire mesh underneath, however I really dislike it from a cleaning perspective. WOW. HOW did you learn to do all this stuff? I am very impressed. 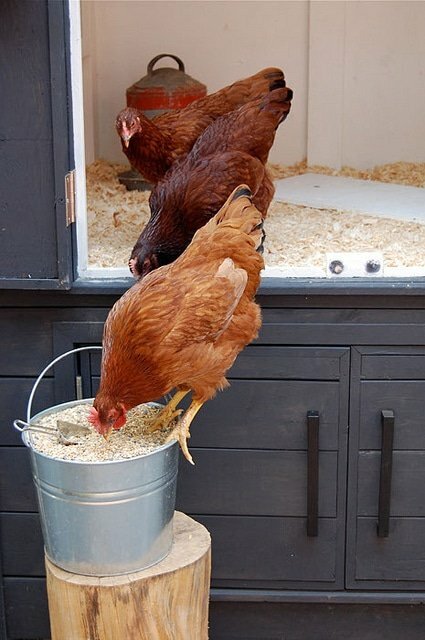 I am just aspiring to having chickens – so have been poking thru Coop ideas – and this is fabulous! I wish I had the 1) knowledge 2) energy to accomplish something like this. Bravo!! Good for YOU and good for your lucky chickens. What are you working on now? And BTW, I for one would have been happy to read thru your funny bits! Thanks for sharing. GREAT job!!!! Thanks Marcia – At the moment I’m remodelling my kitchen. If you sign up for my posts by email you’ll get all the info as it comes in. 🙂 (I post 5 days a week) ~ karen! It’s lovely. 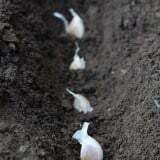 Now you hens get laying! 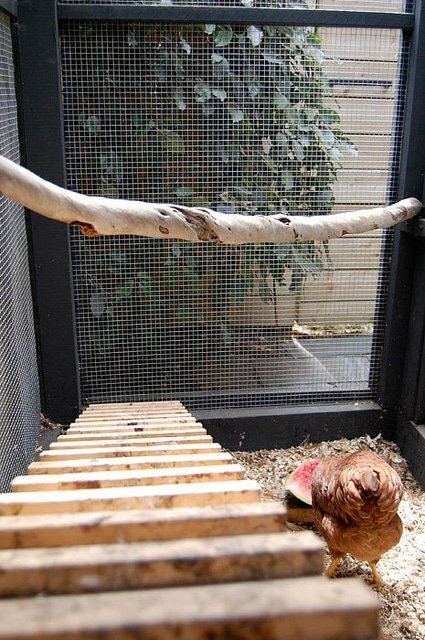 Is the chicken cam going in it at some point? Wow wow wow!!! It’s absolutely gorgeous! That is FANTASTIC, Karen !!! 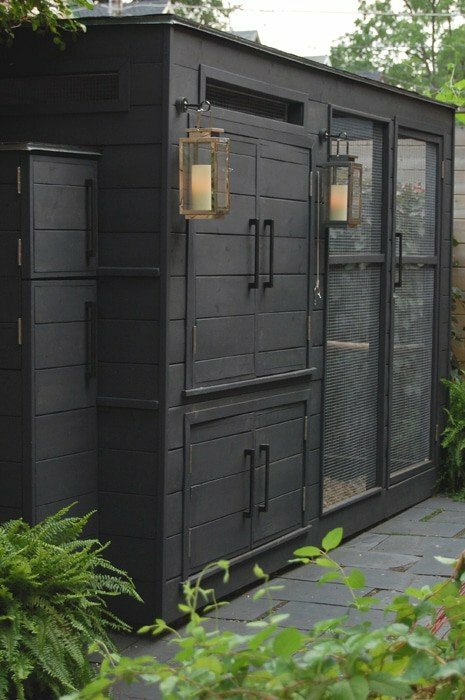 My mother will be so jealous 1 She’s had chickens her whole life and my hubby wants to build her a coop but I bet it won’t be as snazzy as yours ! BRAVO,Girl…WELL DONE !!! It’s absolutely beautiful! Nice work. Truly stunning – I knew it would be fantastic but truly outstanding… well done. So impressive!!! By-the-way I would never skip over the funny writing. I have no words – it’s gorgeous. I’m jealous of chickens – is that wrong? Amazing!!!! Fabulous pictures, that watermelon is my fave!!! What a sweet poulet suite! Great job! Oh my stars! I LOVE it! 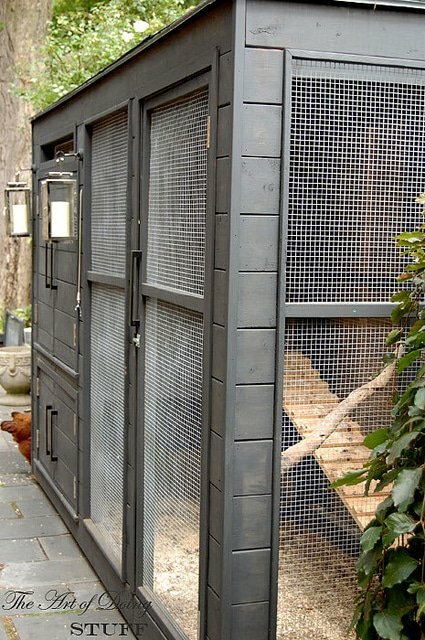 Now to figure out how to get my fella to build one for me…because now, thanks to you, I NEED me some chickens. 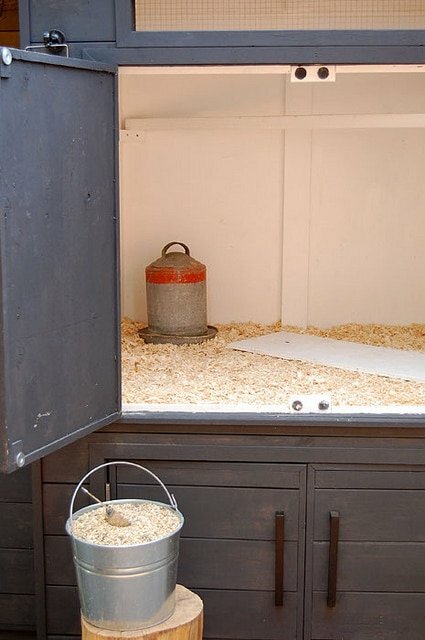 Well, I should have known, as a regular reader of this blog, that your chicken coop would be more fabulous than my apartment, but DAAAAAAMN. I need to say it again: DAAAAAAMN. 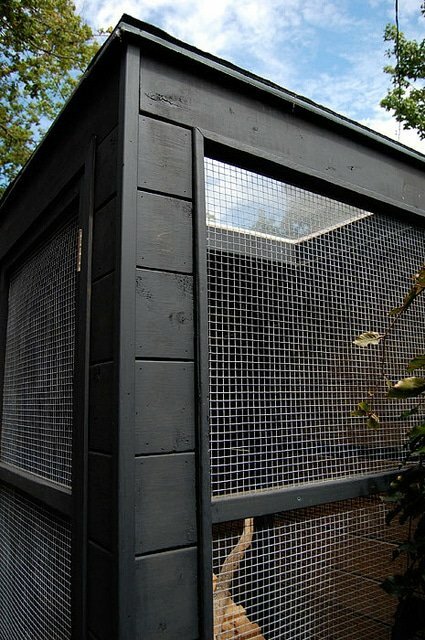 I now want a house so I can get some hens and also have a fabulous chicken coop. It’s really beautiful, Karen! Thanks so much for sharing. The photos are truly great too. Brava! Brava! You should be *very* proud, Karen! ha ha. rare earth magnets predator proof. you realize that raccoons have hands right? and their arms are very very strong? Take THAT george,, you tell him Karen !! ha.ha. and WOW, lucky chickens, you thought of everything! love it. I’m so sorry it took so long to respond to you Heather! I had rare earth magnetted myself to my fence while trying to pet a raccoon. And thanks. I still love my coop too. ~ karen! Hi Karen. It’s exquisite! Much more involved than what I expected, but also not, knowing you and what your projects are like. About the screens, you said they’re pull out screens. 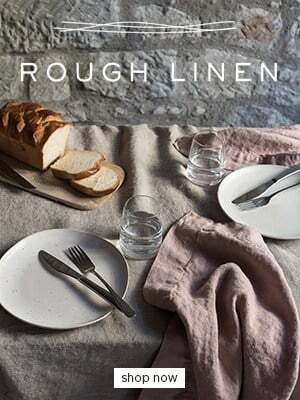 Does that mean that you just set them in place and then remove them to close up at night, or do they actually tuck into the structure and then get pulled out and flipped into place? I couldn’t tell from earnestly checking out the photos. I don’t know why that matters so much to me??? I am very, very impressed and your coop, more than any other I’ve looked at, makes me believe I can have chickens in my little yard. Thank you for such a thorough and lovely presentation of what you’ve accomplished. I’m sure you have incredibly happy chickens. Oh, and I agree with Laura. 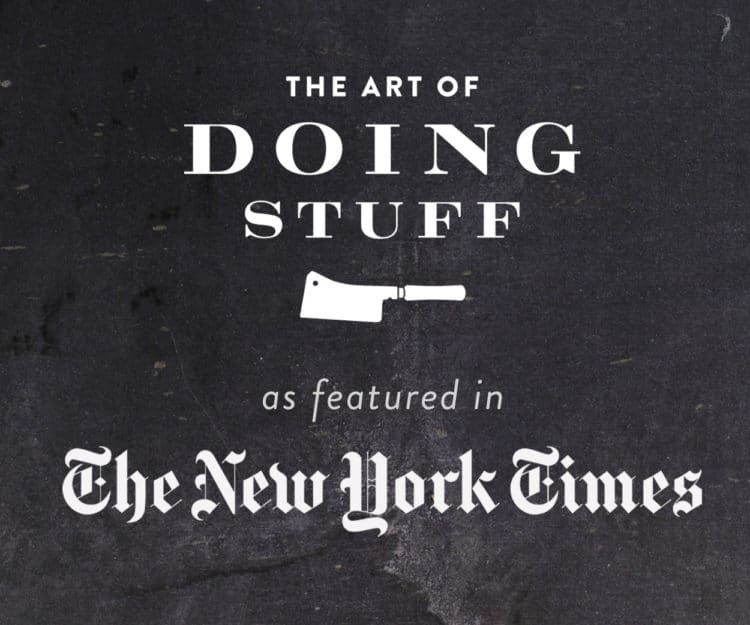 I’ll never skip over funny, which means I eagerly devour everything you write. It looks awesome! Great job. 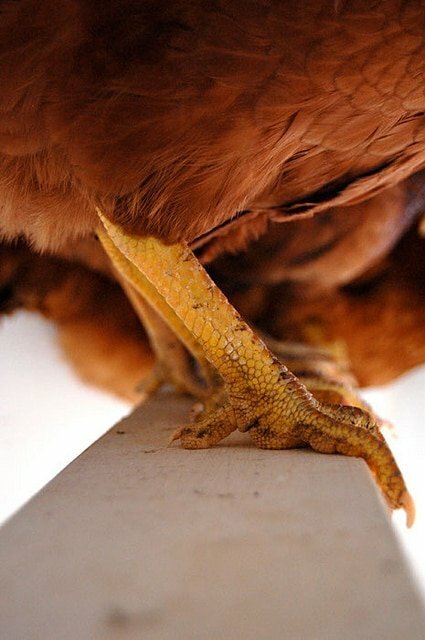 Now if your a chicken, and you have to be cooped up.. This is THE coop du jour you handy girl you!!! That is beyond brilliant. Congratulations Karen, your hard work has certainly paid off. And there I was wondering how you could have hens out in your garden without spoiling the (gorgeous) look of it… mission accomplished. Wow! That is a fine piece of handy work. 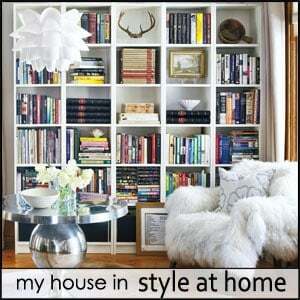 I think it is Style at Home worthy. I kept thinking, “When will we see the gosh darn chicken coop?” Occasionally, I even thought you were going to shock us all and announce that the whole chicken thing was in the frying pan. 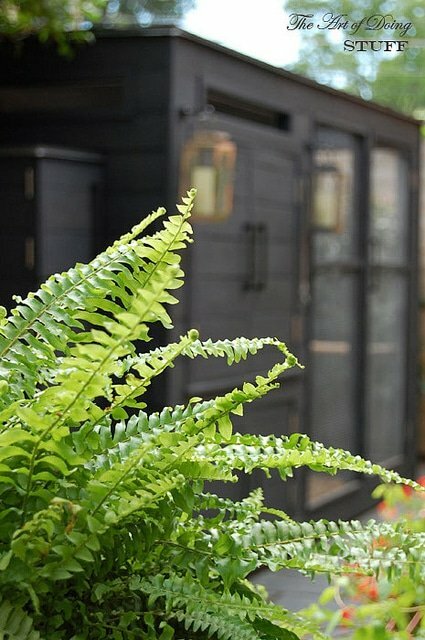 I hope you have taken some time to celebrate with a little housewarming hen party! Bloody hell Karen! I was expecting it to be good, but this is brilliant. Can I live there? I’ll be tidy and even make the chicken noises. Can’t promise an egg though. Let me know! Well…that’s just about the greatest thing I’ve seen in awhile! 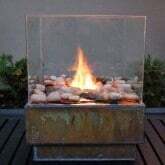 It’s beautiful…so functional…and looks amazing in your backyard. Be proud! You did an amazing job. Congrats on getting it finished. Bravo….Bravo!!! Well, that was worth waiting for! Though I never would have skipped the funny writing, either, it was a wise move not to dilute the attention to the writing or the pictures. Fantastic job, Karen. 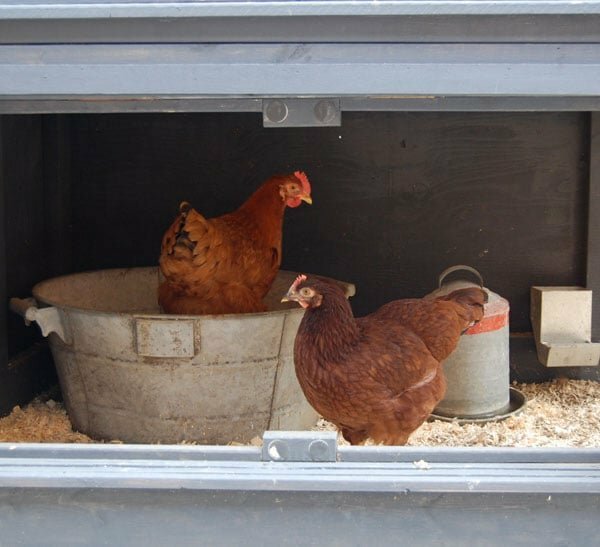 My sister’s chickens are living in a horse stall – very basic – and they love cucumbers. Has anyone told you that ONE wing has to have the feathers clipped or your chicks will fly over the fence and be prey for dogs, etc. 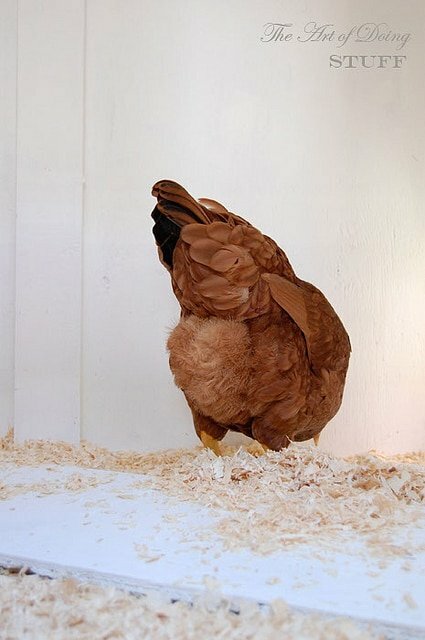 This is done by catching your hen, spread out the one wings feathers and using a pair of regular scissors cut off the longest part of the feathers. They will need clipping regularly or they will grow out and away they’ll fly. This does not hurt, just like trimming your fingernails. Always clip only one wing per chick because if you clip both this will enable them to fly. With one clipped, they will be off balance and can’t fly away. And believe me, a chicken can fly just fine, thank you. 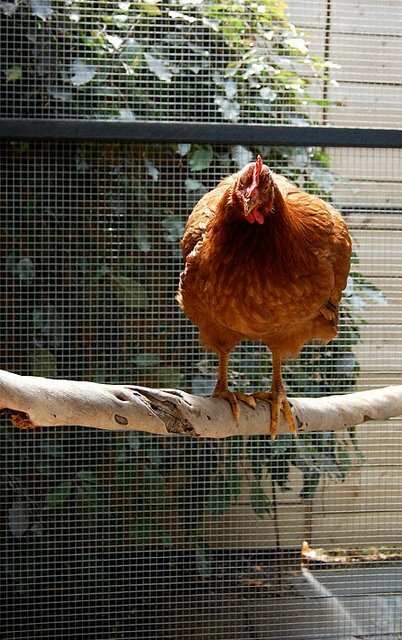 You won’t have any problems with the hens flying over your fence. They might could (although Rhode Island Reds are a bit heavy–so they might not can) but basically they are lazy about flying and are walking birds (like some wild birds actually). If something got after one (dog or predator) they might make it over but even then it is doubtful. This is amazing! You should be so proud! I’m going to use this to convince my mum to let me get chickens. 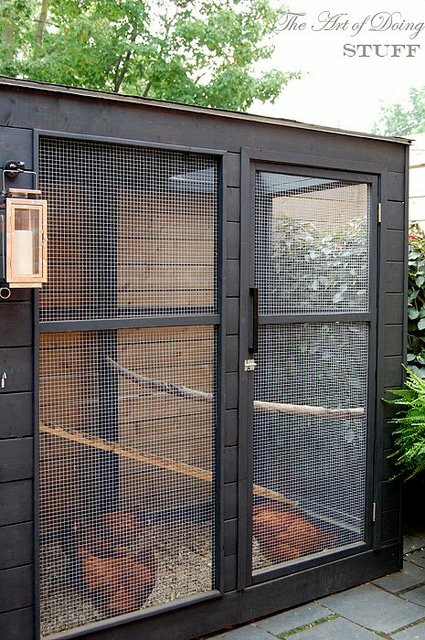 She’s always saying I can’t have chickens until I find a fox-proof, possum-proof, rat-proof coop!! I think this will convince her. I always thought that things you make yourself look home-made, unfinished, crooked. By “you” I don’t mean you Karen, I mean other DIYers. This is incredible. Definitely better than most of my previous living spaces! 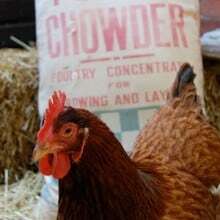 To chickens: realise you’re onto a good thing here, get laying pronto! Wow. Wow. Wow. Did I say wow? A monument to the benefits of OCD and what it can do to fuel a rather ordinary construction project into an Architectural Digest worthy coop! Bravo Karen! My first reaction to this post was ‘where’s the donate button?’ Seriously. This is better then any glossy magazine that I (regularly) shell out $$$ for! WOW!!! Was expecting white? That smokey grey is stunning. Now take sometime to relax and enjoy your hard work before venturing onto your next project. Speaking of which – what is the next project? You do realize that you’ve set your bar VERY high (lol). P.S. Now, show me the donate button! 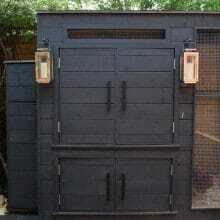 It is gorgeous, I want chickens and I want you to build a coop. 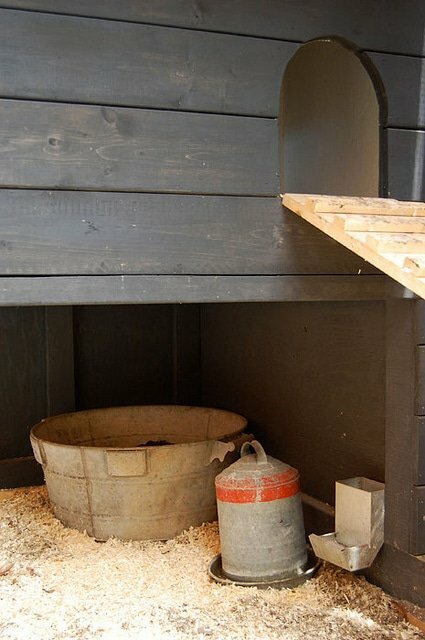 If the blog thing bores you, you might want to go into chicken coop design & build. WOW!The gorgeosity can not be overstated enough. Whoooaa!!!! 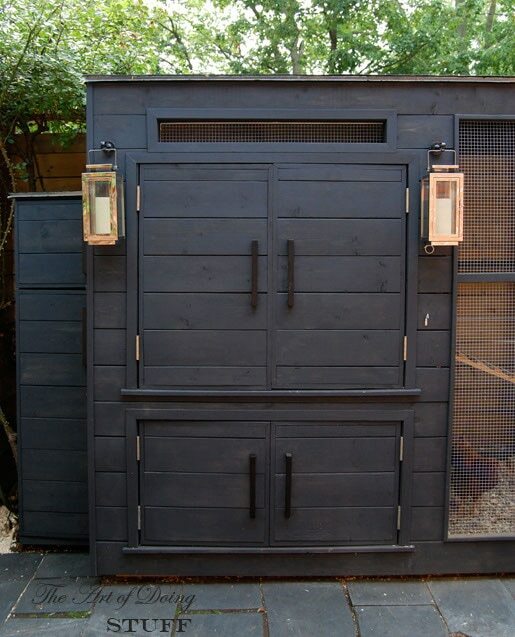 You have sone serious talent Karen – this coop is beyond amazing! Do chickens smile? I think they are smiling – thanks for sharing! SO impressed!! truly beautiful karen! you should be so proud, its so sleek and cool looking, great job! now take a break! as if..
That is just jaw-droppingly (word?) beautiful. I am in awe and quite impressed. 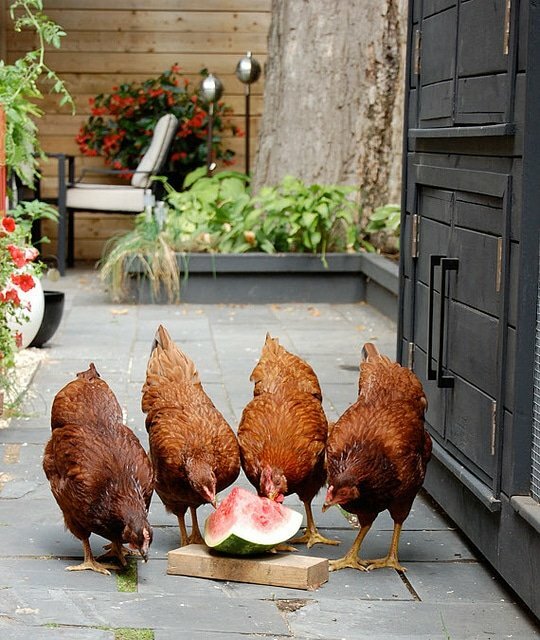 My chickens love watermelon. They, of course, also love corn on the cob, unbuttered and even uncooked. I give them kitchen scraps and let them pick through them. I am not showing them these pictures because they will be very jealous. Just when I think I have seen the best you have you outdo yourself again! 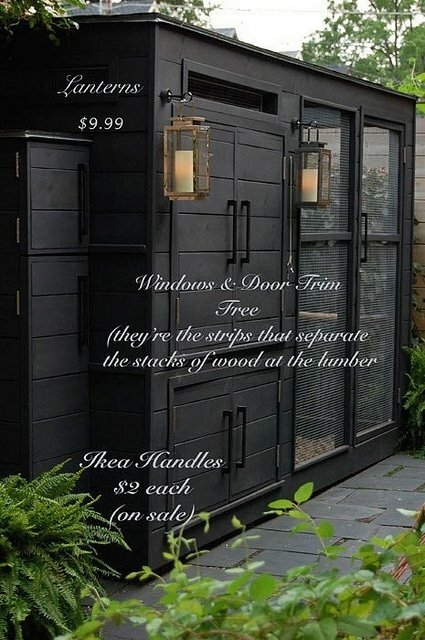 The fence, the backyard and now your hen house?? Perfect!!! It’s perfect, Karen. I want to come back in my next life as one of your girls! Definitely worth the wait! The coop is beautiful. and eggspertly advice for those who live vicariously through your adventures.